Details, details, and more details. This is what weddings are all about or at least it seems that way when you are in the middle of planning one. The task can truly be daunting. Depending on your budget and how much is going to be involved in planning your wedding, we recommend that you consider a wedding planner to help you sort out all of the decisions that need to be made. There are some truly amazing wedding planners in the Atlanta area so there will be one that fits the bill for you. We want to help you with your search so we have provided a guide below with some questions that you will want to find out the answers to in order to hire the wedding planner that will fit you the best. Before you find your wedding planner, you need to find some potential candidates. If you have a wedding venue booked already, ask them if they have an in-house coordinator. What you will want to make sure with this possibility is what level of service they provide. Sometimes the venue coordinator will only deal with the issues of your reception at that specific venue. This is not what you want so be aware of this. Do a Google search for wedding planners in the Atlanta area. Start viewing their websites which should tell you about their background and past weddings they have planned. Pick out a few promising planners and call each one so you can setup an interview. At your meeting, there is nothing wrong with telling them your budget right off the bat. This will give them something to work with and they will be able to tell you what can and can't be done withing certain parameters. Talk about your vision for your wedding. You want to gauge whether they will be able to understand and share that vision. Ask them if this is their passion? You will probably find some that are in the business just to make a living and while that is part of why everyone has a job, you want there to be something deeper there for your purposes. How many weddings have they planned? This is very important because you don't want someone who is learning on the job. There are a lot of details to be very familiar with in the wedding planning business and you want to make sure that the person you are going to hire will have a good handle on every aspect of a wedding. Are they certified? Did they learn the business under someone or did they take courses? Is this their full-time job? We suggest that you only go with someone that is doing this full-time because it shows a certain level of commitment. Are they familiar with your venues? If not, are they willing to go with you on site tours if they are hired? Do they have a preferred list of vendors? What if you want to go with a vendor that is not on their list? Can they help you get discounts on services? Make sure that the understanding is that your planner will represent you in everything and to everyone involved in your wedding. Find someone who can do both logistical and design planning for you. Ask if they are willing to be present at your wedding on the day of in order to make sure all of the details come off as planned and to handle any issues that might crop up. Of course your conversation will ultimately come down to cost. More than likely they will show you package deals that they offer. If you see one that fits your situation and what you need and want, you then need to decide if the price is right. If the cost is within your budget, you are in business. If not, you can always discuss how they might be able to work with you in order to get to where you need to be. 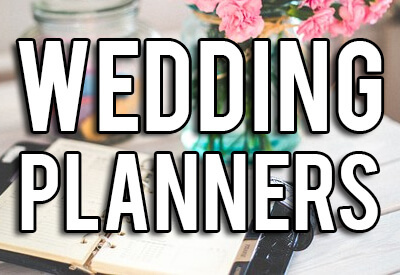 We hope this guide helps you with your search for a wedding planner.